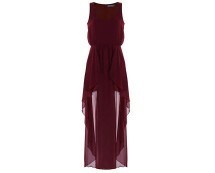 For something quirky, stylish and unique this season this Lou Lou chiffon dress is an absolute must! The design features very unique cut away shoulders which maximises its style quality and a lovely Cosmo print which is a stunning and striking feature that will ensure any girl stands out from a crowd. This dress will flatter all girls; the dipped hem design in this lovely floaty chiffon fabric will drape over the body in a delicate and smooth way and will not cling. The belted waist will cinch you in to create beautiful eye catching curves in all the right places and the undergarment attached ensures you do not have to worry about it being see-through. 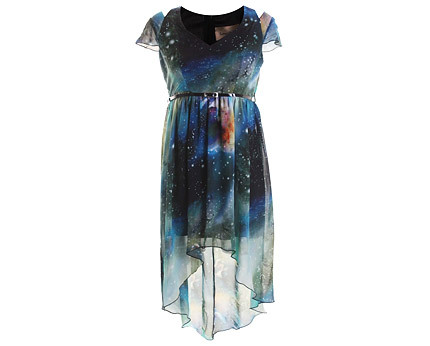 Keep styling simple with this striking Dip hem Cosmo dress and allow it to shine in all its full glory by teaming with towering heels or wedges, a cropped jacket and minimal accessories! Take the less is more approach, and you are good to go!